If you’re reading this post, I will assume that you’ve already decided to migrate your site to WordPress. Rather than re-hashing the Drupal versus WordPress SEO debate, I’ll focus on some technical details that affect your SEO efforts when migrating from Drupal to WordPress. First, let’s start with some basics. Can I preserve my SEO during the migration? The quick answer is, ‘Yes’. It is possible to preserve search engine optimisation during a migration. However, it can be easy to overlook the idea that you might end up with better SEO by revisiting your approach entirely. I’ve had site migrations where replicating optimisations from the Drupal version wouldn’t have made a significant impact in the business—or at the very least, where SEO was something that could be improved after the migration. If your site falls into this category, I would not recommend putting too much into preserving your Drupal optimisations. The money spent hiring me or anyone else may be better spent on improving the WordPress SEO after exporting your Drupal content. Using or building an SEO-friendly and responsive WordPress theme. Improving page load times. WordPress is a lighter CMS so you should get this ‘out of the box’ but you can lose any gains if, for example, you replicate calls to third-party libraries. Of course, you should consult an expert if you rely heavily on search traffic. Preserving SEO may be vital for your site but it’s worth making a conscious assessment about the investment needed. What kind of work is involved in preserving SEO? Making further adjustments as directed by an SEO consultant after she analysed her webmaster tools. Remember that SEO isn’t a one-time effort. The project needed multiple months of on-going work. Further, I was taking direction from the client’s SEO consultant who incurred her own separate fees. Thus the client allocated a sizeable budget for SEO alone. In his case it was worth the money because the Drupal site earned him many times that amount on revenue from search traffic. Minimising any negative impact on SEO after migrating to WordPress was a priority. How much time and money you’ll need to allocate for your migration depends on a range of factors that are very specific to your site. You’ll only know after doing some in-depth analysis and documentation. Here’s an article on Search Engine Journal that I send to clients when they ask about the SEO impact of a CMS migration: How To Avoid SEO Disaster During a Website Redesign. It’s worth a read and afterwards you can think about how much SEO should play a part of your site migration project. What exactly will affect SEO during a typical Drupal to WordPress migration? Here are a few SEO considerations to keep in mind for your migration project. It’s certainly not an exhaustive list but paying attention to these points should cover the basics. A lot of the on-page SEO comes over as a natural side-effect of most content migration processes. For example, page titles, content keyword optimisation, sub-heading tags, image file names and internal linking are all embedded into the Drupal node content. These remain intact when the nodes are imported into WordPress, unless content cleaning or other manipulation is part of the project. Other areas, such as URL structure, meta data and load speed will need work due to the differences of the two systems. Off-site SEO will be unaffected by a CMS migration as long as you have the necessary redirects set up to catch URL changes for any backlinks. This is an effort that’s external to the site so not within the scope of this article. URL structure is one of the SEO areas that will change after a CMS migration. A big part is because of some important differences between how Drupal and WordPress handle URLs. Drupal creates URLs using either the node ID or a URL alias stored in its database’s url_alias table. Take a look at some sample entries. You’ll see an entry for node/28 associated with a URL alias projects/april. This means that under Drupal, the page with node ID 28 can be accessed using either http://example.com/node/28 or http://example.com/projects/april. Not shown is that content can have multiple aliases. The site could therefore also have another entry node/28 associated with URL alias projects-april and yet another with my-projects/april. You will always be able to find a page by appending the URL alias entry in the url_alias table to the site’s domain name. WordPress has a different mechanism for creating URLs. Rather than relying on database entries, it generates rewrite rules and builds the permalink dynamically depending on your permalink settings. WordPress’ closest equivalent to the Drupal url_alias is its permalink slug stored as the post_name in the wp_posts table. Under my standard Drupal to WordPress migration, I migrate over the Drupal aliases by converting them into WordPress post name slugs. (See the table mapping in a separate article, Drupal to WordPress migration: posts table mapping.) 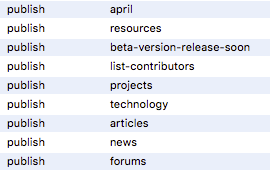 If you have the Post name structure set in the WordPress Permalinks Settings, you’d then find the Project April page at either http://example.com/?p=28 or http://example.com/april/. Note that this would cause an SEO problem because the new WordPress link does not match the old Drupal link. We would have to do some extra work to solve this problem. For example, if the april node was a page, we could create and link to a parent Projects page to create the Drupal http://example.com/projects/april structure. Alternatively, if it was a post, we could create a projects category or tag and set the Category base or Tag base setting. We could also create .htaccess redirects or use one of the many WordPress redirection plugins. The exact solution would depend on your project’s requirements. Aside from the differences in how URLs are stored and generated, you should also be aware of WordPress permalink constrains. These will have a big impact on the amount of work needed to preserve your Drupal SEO when migrating to WordPress. I’ll briefly summarise them below. The Drupal URL alias has a 255 character limit but the WordPress the post_name field stores only 200 characters. Make sure to keep track of any truncated posts names and create a corresponding redirect. Since there’s no WordPress equivalent of the Drupal url_alias table, you’ll need to decide which alias will be converted into the post name. You should create separate redirects for the other aliases. WordPress slugs which create the permalink are essentially a URL-friendly version of the post title. WordPress automatically cleans up the post title to create slugs for new content but you may encounter problems when migrating Druapl aliases into slugs. Characters that would be valid within a Drupal alias are invalid as a WordPress slug. For example, you cannot have forward slashes, accented characters and quotes in your WordPress slug. You’ll need to clean up and keep track of any problem aliases, otherwise WordPress will not be able to serve the page. As previously mentioned, under Drupal you will always be able to find a page by appending the URL alias entry to the site’s domain name. WordPress does not store any records of its URL structure. You will end up with broken links and a potential SEO nightmare if you change the Permalink structure settings without consideration. It’s easy to forget Drupal’s powerful taxonomy system is capable of generating listings that attract valuable traffic. Use webmaster tools to audit your site traffic to pick up on any such listing pages. Unlike Drupal which allows for multiple vocabularies, WordPress only offers one set of categories and tags out of the box. Replicating your Drupal taxonomy listings in WordPress may take considerable development but a quick fix may be to manually replicate the important listings pages. Obviously the size of your site will dictate if this will be feasible. Menu structure and breadcrumb navigation is often an important part of your SEO. Ensure that your selected WordPress theme both supports breadcrumbs (some don’t) and the same type of breadcrumbs e.g. hierarchy, attribute and history-based breadcrumbs. Also remember that you may have installed modules that generate metatag information contributing to your SEO. Export these from the relevant Drupal table and import them into the WordPress database using the format for your preferred WordPress metatag plugin. For example, if you used the Drupal metatag module and would like to use the WordPress Add-Meta-Tags plugin, you’ll need to extract data from the metatags table and insert them into wp_postmeta table as a meta_key and meta_value pair. Keep in mind that some investigative work will be necessary to find out how your preferred modules and plugins store their data. WordPress has a setting to discourage search engines from indexing site. It can be found in Settings > Reading > Search Engine Visibility. It’s normal to have this checked during development but make sure you disable it when launching. WordPress, in general, requires fewer hosting resources than Drupal. You could very well find that a slow site on an under-performing server running Drupal becomes more responsive under WordPress. Don’t take this for granted, however. Use the migration as an opportunity to make improvements. Thoroughly vet plugin candidates to make sure they’re not pulling in third-party scripts that will increase page load times. Also avoid bloated page-builder themes. In my experience, these can be terrible for load speed as they try to cram in every conceivable bit functionality, thereby drastically slowing down what could have been a nimble site. As may have gathered by now, the amount of work and budget needed will reply on many factors. It’s not possible to prescribe what will be necessary for your site without in-depth detail about your configuration and requirements. Nevertheless, I hopefully will have given you enough information to get started with planning an approach.